Would you like to join us on our yearly holiday in 2018 to Southern France, learn to paint or improve on existing skills and free your inner artist. We have great fun over there discovering new ways in which to create using wet-on-wet oil with acrylic and mixed media added in. Accommodation is luxurious with every need catered for: delicious food prepared with local produce created by our in-house chef who has trained with two famous chefs as seen on television. We also have a fully qualified wine tutor so each meal is partnered with excellent wine. 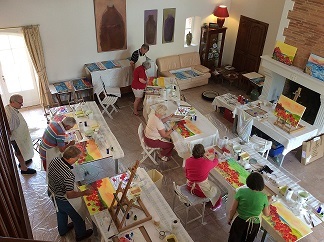 We are also happy to announce that we have new and interesting optional day trips out, ranging from a trip into Toulouse to see historical floor to ceiling high wall paintings to wine tasting in a vineyard not previously visited to meeting local artists and visiting their studios. Finally, we have a local massage therapist available for providing that extra bit of relaxation. You can see a basic outline on this website. However, please feel free to contact me for the booking form which contains full details of the trips out.